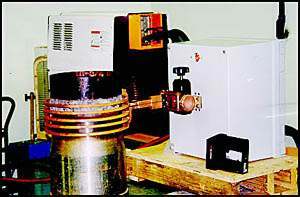 Dyna-Flux® is a solid-state 25 kw induction heating system ideally suited for heat treating, annealing and brazing operations. In the operation shown in the photo, a section of an oil pipe, about 12 inches in diameter is annealed prior to healiarc welding and post annealed at 1200°C for 30 minutes after welding. This process diminishes the possibility of stress cracking after the subterranean installations of the pipe. The photo only shows a small section of the pipe in which an intermediate metal is applied. After this operation this piece is welded to another pipe of the same diameter which is about 20 feet long. In this process the welding is performed with the pipe in a horizontal position. A visible temperature gage and infrared system is employed to monitor and control the annealing temperatures. In field operations many of these pipes sections are coupled in series, often miles long, drawing oil from a multiplicity of wells. The Dyna-Flux® is a versatile system utilized in many applications. The L.C. Miller Company provides engineering assistance on manual, automatic and robotic systems. The Dyna-Flux® systems are available in a broad range of frequencies and power ranges for any application.